This book can be treasured by history buffs for its fascinating facts and the author’s graceful and engaging style. Its description of Hitler’s transformation from an impoverished art student to Führer of the Third Reich may also stimulate reflections on the rise of an often-bankrupt real estate developer to the oval office in the White House. James M. Longo, a professor at Washington and Jefferson College, helps the reader to understand the psychology (and physiology) behind the idiosyncrasies of all the major actors—from Emperor Franz Joseph and his offspring to Hitler and his adjutants. Thus, we learn that the designated heir to the Habsburg throne, Archduke Franz Ferdinand, was asthmatic and somewhat reclusive, but was also an aspiring multiculturalist who hoped to remodel the Habsburg realm from a centralized hierarchy to a modernizing and liberal polity somewhat like the United States. While Kaiser Franz Joseph rode in a carriage pulled by four Lipitziner horses, his heir liked to ride in fast autos chauffeured by Ferdinand Porsche. Because the archduke’s Czech-born wife Sophie was never accepted by the Habsburgs, Franz Ferdinand kept two carriages—a fancy one for when he traveled alone as a pure Habsburg a more basic one for him with his family, given the name Hohenberg from an extinct dynasty. Quick paced and reading like a novel, this book provides a psycho-history of Hitler. As Germany’s chancellor, why was he determined to catch and put away two sons of Franz Ferdinand? He arrested them in 1938 and sent them (with other aristocrats and famous persons) to a concentration camp at Dachau. Hitler despised the multicultural plans of their father, so different from Hitler’s own Aryan dream world. As a destitute and homeless Hitler shoveled snow outside Vienna’s Imperial Hotel in 1909, he watched and resented the sparkling reception inside for the Habsburg royalty. Following Germany’s annexation of Austria in 1938, a triumphant Hitler arranged for himself to be the focus of another glittering reception in the same hotel, which still gleams at Kärntner Ringstraße 16. Longo’s book makes a nice bookend to Benjamin Carter Hett’s The Death of Democracy, reviewed at NYJB in April. While Hett charts the steps by which Hitler destroyed the Weimar democracy, Longo illuminates the demons driving Hitler from within. While Hitler’s hatred of Jews developed during his teenage years in Vienna, some of his friends there were Jewish. Hitler respected and appreciated the Jewish physician, Dr. Eduard Bloch, who cared for his dying mother. Chancellor Hitler helped Bloch and two Jewish officers under whom he served in World War I to emigrate before the Holocaust intensified. The children of Franz Ferdinand and Sophie encountered hostility from many quarters—from purist Habsburgs in Vienna before and during World War I, from newly independent Czechoslovakia and truncated Austria after the “Great War,” and from Hitler before and during World War II. They again lost most of their property in Czechoslovakia when the country regained its independence in 1945 and expelled most German speakers (three years before a Communist government seized power in 1948). Longo details the lives of Franz Ferdinand’s family and their relatives up to 2018. 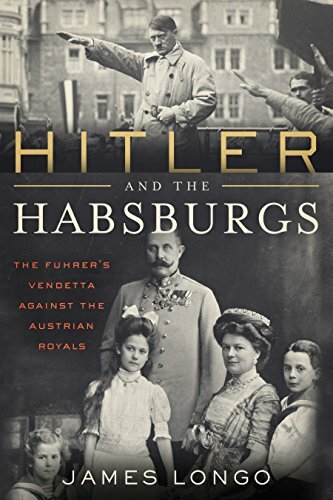 His book is a masterful fusion of information found in at least 140 secondary sources, but it also reflects his conversations and friendship with Princess Sophie Hohenberg de Potesta of Luxembourg, the great-granddaughter of Archduke Franz Ferdinand. She introduced him to other members of the Hohenberg, Nostiz-Rieneck, and Habsburg families. Their recollections illuminate many of the twists and turns of this epic tale. Hitler and the Habsburgs also contains more than 20 photos depicting the main characters. The font and layout of the book are pleasing to the eye, but the editing fails to correct many typos in German and several in English. Besides bringing to life major events in the 20th century, the book also stimulates reflections on the 21st century. The fanatic nationalism and intolerance that led to World Wars I and II have been reborn. Demagogic hate-mongers have gained followers not just in Poland and Hungary but also in Austria, Germany, and the United States. Wealthy industrialists secretly financed Hitler’s rise to power after 1924. To unemployed workers he promised full employment; for the forgotten German, he pledged respect. Hitler won financial support and many followers, but he craved legitimacy and political power to make his vision a reality. In public Hitler met with enthusiastic crowds. Behind closed doors he beguiled wealthy monarchists. One-third of German’s ancient nobility joined his Nazi Party, while many others supported him through their silence. President Trump also craves symbols of legitimacy and seeks to destroy any sign that he was not duly and freely elected. The insightful American journalist Dorothy Thompson interviewed Hitler and described him as an “agitator of genius . . . the most golden tongued of demagogues.” She advised her readers: “Don’t bother about the fact that what he says, read the next day in cold news print, is usually plain nonsense.” To understand what was happening, “you must imagine the crowds he addresses: Little people. Weighted with a feeling of inferiority.” Appeals to their racial pride were “the cheapest form of self-exaltation.” If one was in debt, if one had not made a success in life, there was still the consolation that one belonged to the master race. Hitler was explicit that Germans are a superior race ordained to conquer the earth. Trump does not go so far in glorifying his own race, but he hints at its superiority and the need to expel aliens from United States soil. Trump denies he is a racist but gives his followers every reason to despise people of color—from the Obama family to the Latinos walking northward to the Muslims seeking safe refuge from war and ideological fanaticism. Trump’s suggestions that Obama was born in Africa expressed his racist syndrome. Hitler’s personal life and his policies, like those of Donald Trump, should have made him anathema to serious religious believers. Hitler tried to silence his critics and unite his followers by uniting independent Lutheran churches in a “Protestant Reich Church.” An ardent Nazi, Ludwig Müller became its presiding bishop. He vetted Lutheran clergy to ensure they were “politically reliable” that is, accepted the superiority of the Aryan race. This tactic anticipated Trump’s appointment of Matthew G. Whitaker to be Acting Attorney General in November 2018. A few years earlier, when Whitaker campaigned for the Senate, he courted the anti-abortion, evangelical Christian vote, promising at one forum that he would scrutinize nominees for federal judge to ensure they had a "biblical view of justice." Both Hitler and Trump appointed wolves to guard the hen house. Like the United States under Trump, Germany in the 1930s had its version of sanctuary cities where the Führer’s dictates did not reach. Hitler’s “Eagle Nest” at Berchtesgaden played a role like Trump’s Mar-a-Lago retreat in Palm Beach. Trump did not lay out his plans in a book like Mein Kampf, but his Art of the Deal, written largely by Tony Schwartz, revealed his self-centered transactionalism. Hitler bragged that he was the greatest German of all time; Trump, more modestly, claimed only to be one of the greatest of U.S. presidents. Unlike Germany in the 1930s, the political institutions of the United States continued in the Trump era to offer bulwarks against a would-be despot. More than half the U.S. citizenry had an unfavorable opinion of Trump. By contrast, as Ian Kershaw put it in Der Spiegel Online (January 30, 2008), “between the death of Hindenburg in August 1934 and the expansion into Austria and the Sudetenland four years later, Hitler was indeed successful in gaining the backing of the vast majority of the German people, something of immeasurable importance for the disastrous course of German policy ahead.” In the United States the 2016 and 2018 elections showed that less than half of American voters supported Trump and his policies. The president’s golden tongue might not save him from the revelations still to come of his financial and other transgressions.